For the first eight years of his acting career, James Corden failed to get a single job. Now he is on the brink of making it big in America and sharing in a £2million payday. Corden, the co-creator and star of the BBC comedy Gavin and Stacey, which is nominated for two Baftas tomorrow night, has sold the rights to the series to the US television network NBC. The network turned The Office into a ratings hit and if Corden manages to repeat the success Ricky Gervais has had in America, it could be the springboard to a career which will make him millions. One LA talent agent said: "Two seasons on a major broadcaster like NBC would easily make him £1 million. Ricky Gervais is now a multi-millionaire thanks to The Office and Extras making it in the States, and now he is a major Hollywood player." 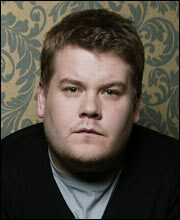 Corden, 29, grew up in High Wycombe, Bucks, and attended stage school. But he struggled to find work in his early teenage years. He said: "I never worked at all, I don't know why. I think it was the best thing that could have happened to me because it taught me about rejection from a really early age. "At the time it was awful, all my friends were getting parts in paint adverts and stuff." Corden first came to attention in the West End production of Alan Bennett's The History Boys. His big television break came in 2000 when he landed a regular role in the ITV1 series Fat Friends. There he met his writing partner, Ruth Jones, and they came up with the idea for Gavin and Stacey, a sitcom about an Essex boy and a Welsh girl who fall in love. Both have been signed up as executive producers for the pilot episode in the US and will split the proceeds of selling the rights to the show. Industry experts believe Gavin and Stacey will be a hit export. David Butcher, a television critic for the Radio Times, said: "It's got a warmth which they will love in the States and a story that translates easily because it is essentially an old-fashioned romantic comedy." Yesterday Corden told The Daily Telegraph that he was still coming to terms with the prospect of finding fame in America. Of comparisons with Gervais he said: "I can't draw any comparison between me and him, it would be foolish to, and I'd be hugely flattered if anyone thought that." Where to find the season's best designer shades. Seven days in the groove all around the country. Top 10 British places for natural beauty and quality of life. Lesley Garner helps a retiring woman trapped in despair. Terms & Conditions of reading.